Everyone wants to get rank higher in search engine for keywords like Digital ‘Marketing’, ‘Blogging Tips’ and ‘SEO’ etc but it is not an easy job to do especially if a blog or website it totally fresh. Hence, the dream of getting more targeted traffic and higher rank in search engine results pages can come true by using long tail keywords wisely but you may need to spend quality time on keyword research because benefits of keyword research for SEO are myriad. Not only beginner bloggers & webmasters but SEO experts also use long tail keywords to improve SE ranks for their websites and blogs. And if you don’t have a great idea about How to find Long tail keywords for SEO then you have landed to the right webpage as it is all about long tail keywords, how to find them and how to use them effectively in content to secure visible positions in SERPs. More specific and longer keywords or phrases are known as long tail keywords. Internet users usually use such keywords when they are on the go to purchase something or when they are searching for the required stuff via voice search. These keywords are used by businesses and brands to target specific audience rather than targeting the mass audience. Bloggers and digital marketing experts also use these keywords to improve reputation in search engines in order to rank their short tail keywords as well. Below are the benefits that long tail keywords offered to bloggers and webmasters for improving search engine ranks. There will be no need to beat the giant players of the game in order to rank your keywords as long tail keywords always come with little to no difficulty to rank in search engines. Even if you have creatively and wisely used the long tail keywords in your quality content, it will rank higher automatically without building backlinks. You will just need to create SEO optimized content and nothing else. However, you should choose the keywords with high search volume and low difficulty to get better outcomes. If you are seeking for clients and customers for your local business or company then use of the long tail keywords in your digital marketing strategy would be a great way to get highly targeted traffic. By doing so, you will be able to successfully convert visitors into customers by offering them the best products and services according to their needs. Knowing the user intent before creating content for long tail keywords can help you secure more conversions. As these keywords are more specific and longer than others, chances of converting website visitors into customers are always higher. For example, if you are running a computer repair business or company in Baltimore, then using the keyword ‘best computer repair services in Baltimore’ will bring more visitors that will surely avail your services to get their computer related issues resolved quickly. A visitor landed on your website will just need a bit more details and information before placing an order and in this way, you will enjoy more sales and leads as well. How to choose right Long Tail Keywords? The keyword should be at least four words longer to perform well in search results. The longer and specific long tail keyword would be, the more clicks you will get on your link. A long tail keyword with a specific feature or benefit of your product or service can bring more specific and target traffic that will be easier to convert. In order to secure high ranks easily, always make sure you are targeting a keyword with low difficulty score. A keyword with low difficulty is always easier to rank than a keyword with high difficulty. Since there are a lot of keyword research tool for SEO available on the web, AHREFS is one of my favorite tools that not only enables you to find best performing keywords but also helps you to find out the keywords that your competitors are using to gain more targeted traffic. 5- In results, you will get a list of best performing long tail keywords that can be used to create best, engaging and user-friendly content to get high search engine ranks. How To Apply Long Tail Keywords while creating content? When writing content, you should creatively use your keywords in the article in order to prevent any penalty or punishment from search engines. Always use the keyword where fits naturally and avoid insertion of the keyword forcefully. In this way, you will be able to engage readers more effectively. Use of the variations of your keyword is also the best way to appear in more search results. You can keep a fertile balance in keyword density by using LSI (Latent Semantic Index) keywords while creating quality web content. 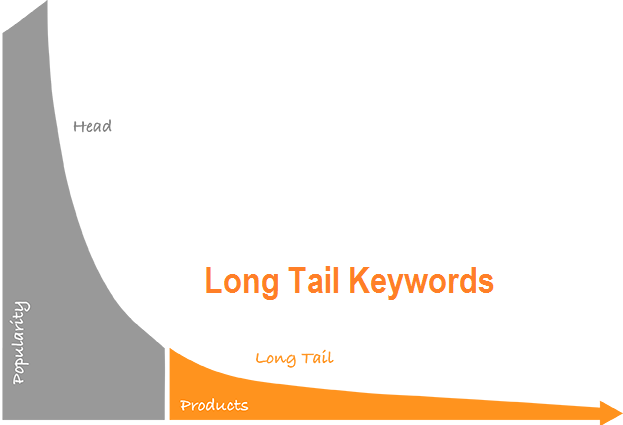 Where to use Long Tail Keywords in on-page optimization? Keyword research plays a crucial roll in SEO and content optimization, which will help increase your Google rankings. With the right keywords in strategic area of your copy, you can rank your content high on search engine with little effort. That is why performing keyword research is important to your SEO campaign. Shreds is a great SEO tool,I just began using very recently. I have been using SEMrush keyword tool. I would recommend either of the two to anyone.